Arc provides tools to score spaces, buildings, and places on real world sustainability performance. Arc scores power a new generation of performance-based green building rating systems and help professionals around the world create better buildings for people and the environment. The Arc team is passionate about schools. We believe that every child should have the opportunity to learn and play in a high performance green school. We know that a green school is more than efficient light bulbs and non-toxic materials. Green schools are living laboratories. With the right tools, green schools can provide hands-on opportunities to support environmental and sustainability education. Arc has partnered with USGBC’s Center for Green Schools to make sustainability performance data part of broad-based campaign to use schools as teaching tools. One piece of this collaboration is the new Arc Digital Playground. The Digital Playground is a special version of the Arc platform where teachers and students can learn about science, technology, and math (STEM) concepts using a set of schools pre-loaded with data on energy, water, waste, and other key metrics. Pre-loaded data means that teachers can jump right into lessons on issues like energy efficiency, environmental health, or water conservation. They can use real data to teach basic STEM concepts, practice skills like interpreting charts and graphs, and help students identify real world sustainability strategies. This article will introduce the Playground and describe a lesson that teachers can use today. We hope you will check it out and let us know what you think. We’re excited to add projects and features to help turn building performance into hands-on-learning. What’s in the Digital Playground? Each school has a complete set of operational performance data, including energy, water, waste, transportation, and human experience. You can see aggregated statistics for all four schools under My School District. The data are adapted from real schools projects using the Arc platform. You can learn more about real world scoring and benchmarking through case studies such as the story of Boston Latin School. Boston Latin students engaged their peers, faculty, and district staff to collect data on energy, air, water, waste, and transportation in order to identify the most effective sustainability strategies for a green future. The Digital Playground is more than just a collection of projects. When you see the symbol below in the playground, click to reveal discussion questions, tips, and teaching prompts. The teaching prompts will help you and your students go beyond the data and begin to understand how schools use energy, generate waste, and impact the local and global environment. A First Lesson in Energy: What makes a green school green? How and why does a school use energy? What is the relationship between energy use and greenhouse gas emissions? What are the differences in energy and emissions between an average school and a high performance green school? #1 How does a school use energy? The purpose of a school is to provide safe, comfortable conditions for learning. This means that a school needs to provide physical shelter from the weather and systems to provide light, heat, cooling, and ventilation. First, let’s consider some basic physics. From an energy perspective, a school is a box that separates two environments: indoors and outdoors. The outside of the box receives energy from the sun and exchanges energy with the air and ground. We use energy to heat and cool the air inside the box. We may also use energy for lighting and to power educational equipment. As a general rule, the bigger the difference between indoor and outdoor conditions; the more energy is usually required. These systems make indoor conditions comfortable by using energy, and energy usually results in the emission of pollutants. The type and amount of pollution depends on type and amount of energy used, among other factors. For example, electricity generated by burning natural gas generates more pollution than energy from solar panels. Many schools use natural gas to heat air and water, and they use electricity for ventilation, cooling, and lighting. Click on Credits/Actions, then Data Input, then Electric 1. You should find the graph below. Explore the graph. Each column represents total electricity use in a month. Notice that electricity use is relatively low in June and July. Can you imagine why this may be? What is different about these months? Now click on “Gas 1” and find the graph above. This presents data for natural gas consumption; primarily used for space and water heating. Notice that natural gas use peaks in the winter months and drops in the summer. Can you explain this pattern? Why might natural gas use be higher in the colder months? Can you hypothesize some of the factors that contribute to school energy consumption? What would happen to the graph if the school upgraded an “always on” source of energy use (such as exit signs) with more efficient units? What would the resulting graph for electricity look like? You can learn more about energy use in schools from the US Energy Star Program. #2 What is the relationship between energy use and greenhouse gas emissions? Saving money on energy is important. However, for this activity, we will focus on the relationship between energy and pollution, more specifically the emission of greenhouse gas emissions. These are heating-trapping pollutants that contribute to climate change and a variety of impacts on human health and the environment (learn more from the National Climate Assessment). As we learned in the first part of this lesson, natural gas is typically used to heat air and water. Natural gas is usually burned on-site in a furnace or boiler. Burning natural gas oxidizes methane (CH4) with oxygen (O2) to get carbon dioxide gas (CO2) plus water. Every molecule of methane burned releases a molecule of CO2 gas plus two molecules of water vapor (H2O). CO2 is a natural part of the atmosphere, but burning large amounts of fossil fuels increases its concentration in the atmosphere and gradually warms the climate. Electricity is not typically produced on-site at a school. Rather, electricity is an energy carrier. It is most often produced at a power plant and sent instantaneously to a school through a transmission and distribution system (a.k.a., “the grid”). Emissions from this delivered energy vary place-to-place and over time -- minute-to-minute, hour-to-hour, day-to-day, and month-to-month. If we look at a long period, we can define an average relationship between a unit of electricity consumed and the average amount of fuel used to produce the electricity for a particular place. This relationship is called an “emissions factor” -- the amount of greenhouse gas emissions (and other pollutants) produced per unit of electricity used. This means that the pollution from using electricity is the product of the amount of electricity consumed multiplied by the emissions factor of the electricity supply. We can use the Green School to explore total greenhouse gas emissions over time -- the combination of on-site combustion of natural gas and emissions from purchased electricity. 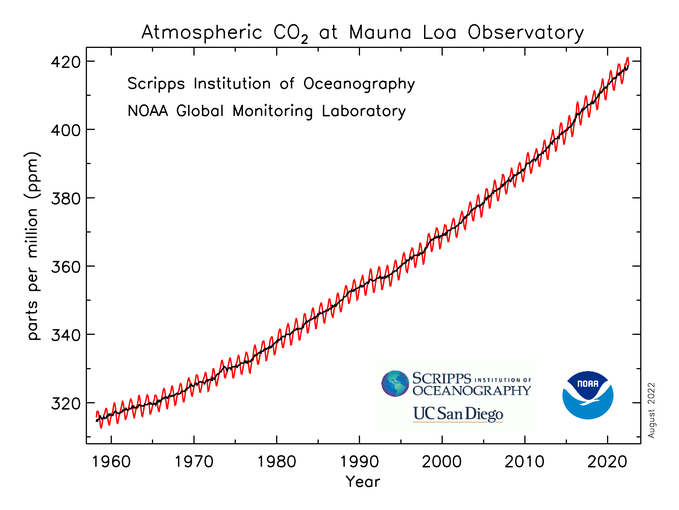 Consider the graph, what would happen to greenhouse gas emissions during a long cold spell? Would emissions go up or down during that period? Conversely, what would you expect to happen if the electric utility replaced polluting generators with solar panels? Would total greenhouse gas emissions go up or down after the switch to solar panels? Try finding the emissions factor for your school by entering your zipcode into the U.S. EPA’s Power Profiler. Is your electricity cleaner or dirtier than the U.S. average? You can learn more about energy and greenhouse gas emissions from the U.S. Energy Information Administration. #3 What is the difference between an average school and a green school? Now, that we understand a bit about how schools use energy and how energy relates to pollution, let's consider: What makes a green school green? For this question, we will return to the Playground and compare Average Elementary School and Green Elementary School. We have looked at Green Elementary School several times. We know that it uses energy -- natural gas and electricity. The Average Elementary School does the same thing. However, the performance data in the Playground show that Green Elementary delivers more satisfying indoor conditions, while using less energy. You can see these differences by exploring My School District → Building Learners School District → Scores tab. Green Elementary has higher (better) scores for both Energy and Human Experience. On the Carbon tab, we can see that the Green Elementary also has significantly lower total greenhouse gas emissions. Green Elementary emits 207.5 metric tonnes of CO2 per year, compared to the Average School’s 309.5 metric tonnes of CO2 per year. This difference is equivalent to charging 13 million smartphones. Explore other equivalencies using the U.S. Environmental Protection Agency Greenhouse Gas Calculator. You can learn more about high performance schools on the Center for Green Schools website. The Arc Team loves green schools, and we are passionate about the potential for real world performance to serve as a teaching tool. We hope that the Playground provides a place to start this exploration. If you want to learn more about how to score and benchmark schools, check out the resources on the Center for Green Schools Learning Lab. If you want to learn more about Arc, check out our YouTube channel, follow us on Twitter, or send us an email.